Free Shipping Included! Save 1% on the TRENDnet Wi-Fi Everywhere Powerline 1200 AV2 Dual-Band AC1200 Wireless Access Point Kit, Includes 1 x TPL-430AP and 1 x TPL-421E, White, TPL-430APK by TRENDnet at Pacs BG. MPN: TPL-430APK. Hurry! Limited time offer. Offer valid only while supplies last. TRENDnet's WiFi Everywhere Powerline 1200 AV2 Wireless Kit, model TPL-430APK, uses an electrical outlet to create or expand a wireless network. View More In Powerline Network Adapters - Page 2. 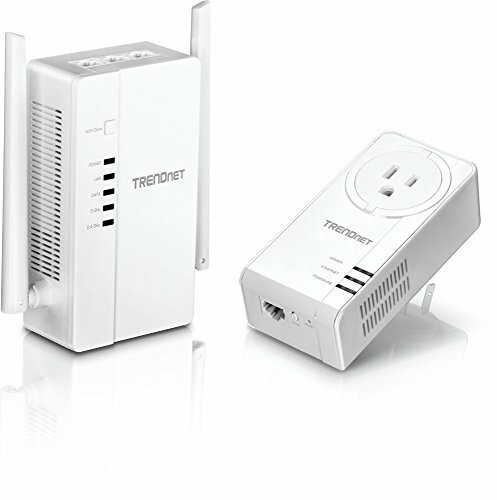 TRENDnet's WiFi Everywhere Powerline 1200 AV2 Wireless Kit, model TPL-430APK, uses an electrical outlet to create or expand a wireless network. Easily install the included TRENDnet Powerline adapters to create a high-speed powerline network. Connect the TPL-421E to the router and plug the TPL-430AP into a power outlet in another room where WiFi connectivity is needed. The WiFi Clone button conveniently copies your existing wireless network settings to the TPL-430AP for faster network integration. Simply plug in TRENDnet Powerline adapters and they will auto-connect to each other right out of the box. By combining wireless and Powerline technology you can enjoy wireless connectivity from any power outlet in your household. Use your router's WPS button and the TPL-430AP's WiFi Clone button to conveniently copy your existing wireless network name and password for quick network integration. CREATE OR EXPAND YOUR NETWORK- TRENDnet's TPL-430APK uses an electrical outlet to create or expand a wireless network. By combining wireless and powerline technology, you can enjoy wireless connectivity from any power outlet in your space. Included in the kit is one TPL-421E and one TPL-430AP. The TPL-430AP is a dual-band wireless AC1200 access point with three gigabit ports. EASY INSTALLATION- TRENDnet Adapters auto connect out of the box. Simply connect the TPL-421E to your router and plug the TPL-430AP into a power outlet to the room WiFi connectivity is desired. Units are pre-encrypted for your convenience. Use up to 8 adapters on a single Powerline network. ENHANCED POWERLINE PERFORMANCE- Performance and range is enhanced from MIMO Beamforming technology. The WiFi Clone button also copies your existing wireless network settings to the TPL-430AP for faster network integration. Backwards compatible with Powerline 600, 500 and 200 adapters. POWERLINE RANGE- Powerline range of up to 300m (984 ft.), providing powerline 1200 networking over existing electrical lines. 3 YEAR WARRANTY- TRENDnet stands by and backs this product with a 3 Year Warranty with unlimited 24/7 Technical support.